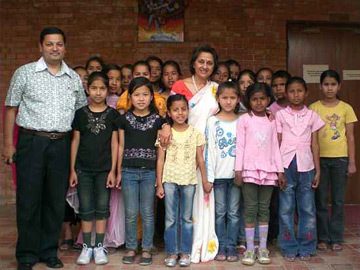 On the happy occasion of the birthday of SAF Founder Ambassador Madanjeet Singh, SAF-Nepal Chairperson Dr. Rita Thapa launched a 15 month music training for children of victims of conflict in Kathmandu on April 16, 2009. 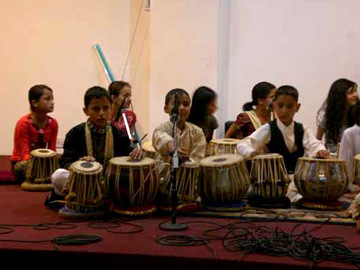 Altogether 20 children, both boys and girls will get training in tabala, violin and flute at the Taal School run by Ms. Sarita Mishra, a prominent Nepali musician. The parent(s) of these children died during the decade long insurgency in Nepal both from the side of the security forces and the insurgent group. Speaking on the occasion, Dr. Thapa outlined the activities of SAF and how the generous contribution by the SAF Founder has helped in several areas such as ANM scholarships on the one hand while initiating other programs such as this. Mentioning that music is the way to peace, she wished good health and happiness to Ambassador Madanjeet Singh.